This post could also be entitled "Research: Kale and other brassica vegetables may protect against heart disease, too!" Sulforaphane ia a compound most widely associated with broccoli. Highest levels of sulforaphane are found in commercially available broccoli sprouts, but are also present in all brassica vegetables. In this recently published research, sulforaphane as an individual molecule (not from a whole food), was shown to activate a protein called Nrf2 in arteries. While the protein is normally present and active in the inner lining of arteries, in areas of arteries that are susceptible to disease, i.e., the bends and branches of arteries, the researchers found that Nrf2 is inactive, which may explain why those areas are sights for inflammation, an early stage in the development of heart disease such as atherosclerosis. Both cell studies and animal studies showed that sulforaphane could reduce inflammation at these high risk areas by turning on the activity of the Nrf2 protein. The researchers next steps are to test whether eating a vegetable such as broccoli (or kale or other brassicas) will have the same protective effect for both prevention and reducing progression in already diseased arteries. Cruciferous vegetables, like kale, broccoli, cauliflower, cabbage and Brussels sprouts, contain high levels of the active plant chemicals called glucosinolates (see one of my previous blog postings about glucosinolates). The glucosinlates are metabolized in our body into another group of molecules called isothiocyanates, which are known to be powerful anti-carcinogens. The main isothiocyanate from broccoli is sulforaphane. Considerable previous research regarding the potential benefits of broccoli and sulforaphane have focused on the anti-cancer effects. 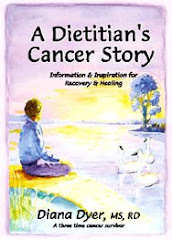 Epidemiological (population data) and animal studies have shown that diets high in cruciferous vegetables result in fewer instances of certain cancers, especially lung, colon, breast, ovarian and bladder cancer. This study clearly adds to growing research that including kale and other brassica vegetables in the diet on a frequent, even daily, basis may have multiple health benefits, however, the portion size needed to experience these benefits will likely be much larger than just nibbling around the edges of the decorative kale on your plate once in a while! Last night I made a stir-fry dish using three different types of brassica vegetables: red cabbage, baby bok choy, and yellow cauliflower. It was beautiful and tasty. I finished it for lunch today. I think that easy recipe might be called the Brassica Tri-fecta Stir-fry! I'll post that recipe and a photo separately. Labels: Research, What's in kale? Wonderful post! Very informative and helpful. Thank you for sharing! I just discovered your site, really terrific....We, too,love kale, and will be spending some time on your site...learning more, appreciating more. We grow lacinato, Russian red, and Winter Red. Diana: Do not underestimate your work...here or there, now or then, time in or time out of mind. Glad you both stopped by my kale blog. Rick, thank you for your thoughtful comment about my work. I know that personal actions by each of us impact the overall health of our environment and society in ways that we cannot immediately see plus ways that we may never know, just as we never see the ending of the ripples created by throwing a stone into a lake. Feel free to check out my thoughts on my other blogs, too. Thanks for providing all of the great info on your site. I am a microgreen grower in Ann Arbor. I grew broccoli microgreens for my family, and speaking of kale, I grew micro red russian kale too, but they were not as zippy as the crowd pleasing pea shoots and sunflower, so I stopped growing them. Thanks for visiting my blog and letting me know about you and your microgreens. I missed seeing you at the HomeGrown Festival (I was volunteering at the heirloom tomato tasting table for Project Grow and then relaxing with some great food to eat in the Michigan beer and wine tent). I'll definitely look for you around town! Looking at the ingredients, I don't doubt that this snack made from kale is delicious, however, the price quoted on the website would take a huge bite out of my (and most people's) budget. It is SO easy, fun, and inexpensive to make your own kale chips. I hope you'll give the homemade version (even with some of these variations) a try, too! Thank you so much for gathering this helpful information! This site is a great resource for people trying to figure out various food research and trying to incorporate more veggies. I need more kale in my diet. Thanks! Ed's of maine Kale Chips....Delicious!!! Vegan White Cheddar and Sour Cream And Onion...By far Best I've ever tasted! Thanks for bringing this to my attention. I've never tried any of the packaged kale chips. I guess I like the process of making my own and knowing the purity of the ingredients, the lack of plastic packaging, and the pennies I spent instead of dollars. I looked for this product on-line and could not easily find what additives were used for the flavorings.